Get Unstuck! Looking for inspiration and practical advice to help your writing? 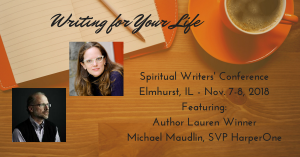 Writing for Your Life welcomes you to the Elmhurst Christian Reformed Church in Elmhurst, IL (suburban Chicago) for our Writing for Your Life Spiritual Writers’ Conference! The conference is open to all who are interested in spiritual writing. This conference focuses on inspiration and craft for spiritual writing, with some “how to get published” thrown in. It includes popular Christian authors and representatives from the Christian publishing industry. The main conference will take place on November 7-8, 2018, with an optional pre-conference DigDeeper Retreat (separate registration required) on November 6. Headline speakers for the event are Lauren Winner, gifted author and seminary professor, and Michael Maudlin, Executive Editor and Senior Vice President at HarperOne, one of the most highly regarded editors in the entire spiritual publishing industry. Michael has worked with many leading spiritual authors including Barbara Brown Taylor, Rob Bell, Marianne Williamson, N.T. Wright, Archbishop Desmond Tutu, Don Miguel Ruiz, James Martin, Shane Claiborne, and the C.S. Lewis Estate. Leading our DigDeeper Retreat and two main conference breakout sessions will be Jennifer Grant (author and freelance editor). Additional breakout sessions feature: Amy Julia Becker (author), Dominique Gilliard (author), Caryn Rivadeneira (author and worship director), Helen Lee (author and InterVarsity Press), Andy Olsen (Christianity Today), Sarah Atkinson (Tyndale House), Vinita Wright (Loyola Press), Sarah Rubio (author and Tyndale House), Karen Neumair (literary agent), and Brian Allain (owner of Writing for Your Life). Unfortunately Sarah Bessey is unable to participate due to an illness. (Click here for an update from Sarah.) Please pray for her speedy recovery. You can learn more about each speaker through the links below. Registration is $359 and includes all General Sessions and Breakout Seminars, lunches, refreshments, one-on-one meetings, and an open-mic session. CLICK HERE to pay now and complete your registration. All conference participants are required to abide by our Code of Conduct.